Your coworkers are so lucky! mmmmmm! Sounds excellent. I’ll have to try it. mmm…sounds delish! okay, but here’s a silly question — isn’t it called a pound cake because it has a pound of butter, eggs, etc? this one has only a half pound of butter….what do you think? semantics? This looks awesome, thank you! Another case of wanting to put in “flavored” chocolate chips (dark chocolate, raspberry, mint, or butterscotch) to see what happens. It was delish! I took 3 slices and ate them all that night! I love a good loaf cake! This one definitely looks like a winner! This looks just amazing! Can’t wait to try it. Oh my gosh! This is absolutely delicious! 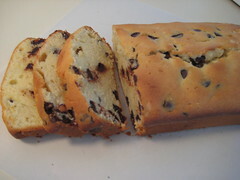 I have been looking for a chocolate chip pound cake for awhile! I always came across that used cake mix. I like to bake completey from scratch, and this recipe was devine! The cake is so moist. Some pound cakes can be so dry, but not this one. Thanks! It’s going in my repertoire of recipes! The cake is the oven right now! I tried making regular pound cake and it came out smelling like boiled eggs. If I use salted butter instead of unsalted? Will there be a difference?